1. NAME AND TYPE OF OPERATION: OPERATION PAUL REVERE IV – Search and Destroy. 2. DATES OF OPERATION: 181000 October 1966 to 312400 December 1966.
a. Enemy situation prior to commencement of Paul Revere IV. During the early days of October, intelligence reports and enemy activity indicated there were significant enemy forces in the southern portion of Kontum Province and near the Plei Djereng CIDG Camp. (2) The Division continued operation PAUL REVERE IV on 19 and 20 October. Light contact was made by the 1st Battalion, 14th Infantry on the 19th which resulted in two NVA soldiers KIA vicinity YA920520 and numerous items of equipment captured. (3) On 21 October the 3d Brigade Task Force, 25th Infantry Division closed into a new forward command post at YA866465. (a) Light contact was made by the 1st Battalion, 14th Infantry in the vicinity YA924521. One NVA soldier was KIA and two AK-47 rifles and eight 82mm mortar rounds were captured. (b) The 1st Battalion, 14th Infantry also had contacts while conducting search and destroy operations at YA928560, YA933559, and YA931532. Results were one US KIA and 14 US WIA. Enemy losses were 16 NVA soldiers KIA and two captured. Six small arms, 350 rounds of small arms ammunition, four 82mm mortar rounds, and numerous items of equipment were captured also. Eight huts and one bunker were destroyed. (5) On 24 October, 3d Brigade Task Force, 25th Infantry Division had light contact when the 1st Battalion, 14th Infantry located an unknown size enemy force vicinity YA923564. Results of the ensuing engagement were five NVA soldiers KIA and the capture of one light machine gun with some ammunition and five pieces of web gear. (c) 1st Battalion, 14th Infantry continued operations on 28 October along the Bo’Lah River towards Ya Krong with light contacts resulting in seven NVA soldiers KIA. c. The second phase of PAUL REVERE IV started on 30 October with the 4th Infantry Division continuing operations in the PAUL REVERE IV area. (a) The only action reported by 1st Battalion, 14th Infantry on 31 October was when one NVA soldier turned himself in with a "Safe Conduct Pass". 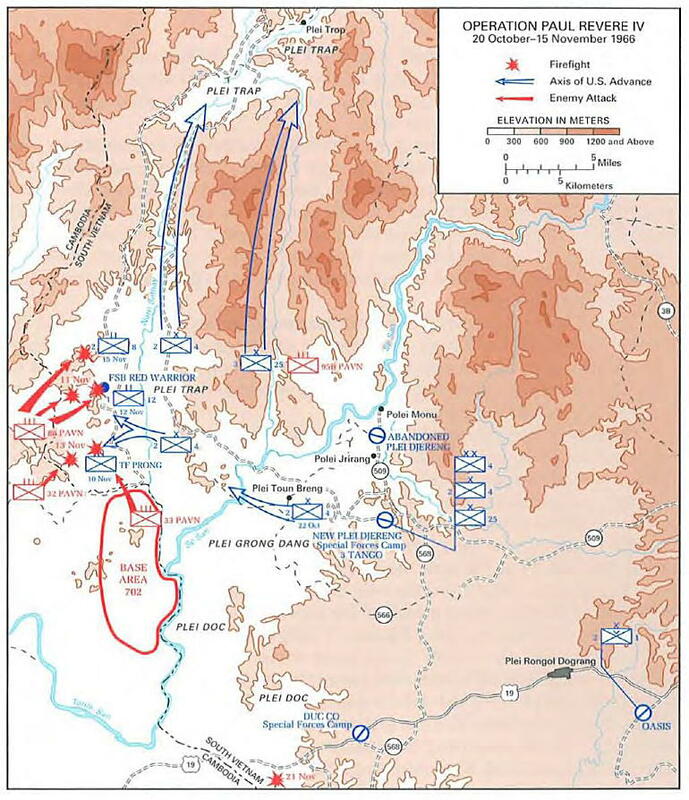 (b) (11 November) The Division had the 1st Battalion, 14th Infantry and 1st Battalion, 12th Infantry plus A and C Companies from 2nd Battalion, 8th Infantry along with Task Force PRONG west of the Nam Sathay River. (c) Elements of A Company, 1st Battalion 14th Infantry contacted an estimated NVA company vicinity YA564510 at 1200 hours on the 13th. The enemy was defending a prepared position and seemed determined to hold the ground. The enemy commenced firing when the company point was within 50 meters of their position. Only four to five men in the point were initially engaged. This contact lasted 45 minutes and was broken by the enemy unit. The company then continued its mission. Contact was again made at 1527 hours in the vicinity of YA570509, this time with an estimated two NVA companies. Again the enemy initiated the attack, firing approximately 200 weapons continuously for 60 to 90 minutes, expending an estimated 10,000 rounds of ammunition. The company organized a hasty defensive perimeter. The attack commenced 50 meters from the perimeter, closing to within 15 meters. The entire friendly element was under fire. C Company moved to assist A Company and linked up at 1705 hours. Results of the overall action were 15 US KIA and 38 US WIA. Enemy losses were 35 NVA KIA. (b) C Company, 1st Battalion, 14th Infantry, while conducting search and destroy operations, located a regimental size NVA base area consisting of 208 bunkers at YA600501 and YA606502. (21) On (19 November), B and C Companies, 1st Battalion 14th Infantry, with a CIDG Company from Plei Me had heavy contact with an estimated two NVA battalions. (a) The contact started at 1205 hours at YA610500 and did not diminish until approximately 1640 hours that day. B Company, 2nd Battalion, 35th Infantry, part of the division reserve, was committed to the 1st Battalion, 14thInfantry area of operations. The 1st Battalion, 14th Infantry planned to destroy the large 208 bunker complex discovered the previous day. B Company was to maneuver on an axis parallel to the CIDG Company from YA614525 to LZ "Rio" located at YA605516 and then south to the bunker complex located at YA604502. In the vicinity of the bunker complex a LZ was to be cut so that an engineer platoon (2nd Platoon, D Company, 65thEngineer Battalion) could be lifted in to destroy the bunker complex. B Company, 1st Battalion, 14th Infantry, was to act both as a security force for the engineers and as reaction force for the sweep of C Company and the CIDG Company to the south and west of the bunker complex. They would then close back to LZ "Rio" for the night. C Company, located at LZ "Rio" at YA605516 planned to patrol south to the bunker complex in front of B Company and the CIDG Company. With one squad of engineers that accompanied them, C Company was to start a LZ near the bunker complex. After B Company and the CIDG Company closed into the bunker area, C Company was to patrol in conjunction with the CIDG Company to the south then to the west and then to the north, back to LZ "Rio". They were to go within 11/2Km of the Cambodian-Vietnam border, keeping the CIDG on their right flank as they made a sweep clockwise around the bunker complexs. The CIDG Company planned to patrol on an axis parallel to B Company from YA614525 to LZ "Rio" and the south to the bunker complexes. From the bunker complex they planned to patrol on an axis parallel and on the right flank of C Company in their sweep of the area around the bunker complex. The Recon Platoon coordinated with the CIDG Company and planned to work with them. The movement went as planned during the morning of 19 November. C Company moved to the bunker complex with B Company and the CIDG Company following on two axes. C Company reached a fairly open area and broke for chow while B Company and the CIDG Company moved through them toward the bunker area. The CIDG was on the west and B Company was on the east as they moved south. At 1207 hours B Company’s right flank began to receive small arms fire and grenades from the southwest. Shortly thereafter the point of the CIDG Company made contact with a well defended fortified enemy position employing numerous snipers. The enemy attempted to infiltrate the friendly forces and also demonstrated a determined effort to hold their position. The enemy initiated the action when the advance guard of 20 to 30 men were within 50 meters of the fortified enemy position. Since the CIDG was moving in a file, their point fell back to bring their company on line. This put the Recon Platoon, B Company and CIDG on line in that order, from east to west. The CIDG was to the right of the Recon Platoon. They began to advance under heavy small arms fire and were hit from the west, on the Recon Platoon’s right or west flank. B Company was also receiving heavy fire from the front. In all there were approximately 360 friendly troops engaging what was later confirmed by a POW to be two Battalions of the NVA 33d Regiment, Le Loi Division. B Company moved to assist the CIDG Company and became heavily engaged from the west. C Company maneuvered to aid B Company and the CIDG, but also became heavily engaged and pinned down at 1525 hours. One platoon from C Company was left at YA606503 to clear and secure an LZ to extract the wounded and the CIDG pulled back to help secure it. At this time B Company maneuvered two platoons against the enemy and heavy contact was broken at 1640 hours. At this point the decision was made to pull back to the new LZ, extract the friendly WIA and bring artillery and air in on the NVA positions. This decision was carried out during the rest of the afternoon and early evening under harassment from NVA snipers fighting from trees and bunkers until 1843 hours. A total of four airstrikes were called on the enemy positions. Approximately 1800 rounds of 105mm and 100 rounds of 8 inch artillery fire were expended. The 4.2 inch Mortar Platoon expended 300 rounds on the enemy. For the night B and C Companies with the CIDG Company and Recon Platoon closed into a perimeter around the LZ located at YA606503. It is interesting to note that on two separate occasions during the day’s operation the battalion primary frequency was jammed. Results of this contact were 19 US KIA and 47 US WIA, 3 CIDG WIA, and 2 USSF WIA. Enemy losses were 166 NVA KIA, 1 NVA captured, 6 AK-47 rifles, 2 SKS rifles, 20 hand grenades, 5 packs and other miscellaneous items of equipment. (a) It was at this stage of the operation that a series of B-52 bomber strikes were planned and requested to support the units in the southwestern portion of the AO. One strike was requested for 20 November on the large bunker complex. It was necessary to move units out of the area to meet minimum safety requirements. (a) A and C Companies, 1st Battalion, 14th Infantry and 2d Battalion 35th Infantry, with an engineer team arrived at the northern edge of the 20 November B-52 strike area at 1215 hours. A Company sighted five NVA soldiers vicinity YA610497 at 1235 hours and killed two of them. B Company, 2d Battalion, 35th Infantry and the engineer team received small arms fire from trees and bunkers in the vicinity YA605493. The area was searched and 14 bodies were found in a grave. Also found were one machine gun and eight AK-47 rifles. (26) There was no significant contact on 24 November. (a)The 1st Battalion, 14th Infantry discovered a cave complex vicinity YA601501, while searching a B-52 strike area. There were 50 NVA bodies found in the cave and 16 other bodies found in the surrounding area. (28) On 27 November the 1st Battalion, 14th Infantry was airlifted back to 3d Brigade Task Force, 25th Infantry Division base camp for rest and refitting. There was no significant contact throughout the AO during the day. (a)(2 December) The 1st Battalion, 14th Infantry, conducted an air-assault to landing zone 511A at YA761625, closing at 1225 hours. The unit located 35 enemy bunkers in the vicinity of YA752640. (7) On 9 December, only minor enemy contact occurred during the day’s operations. No change was made in unit missions. (a) The 1st Battalion, 14th Infantry reported the capture of two NVA soldiers with small arms and 100 rounds of ammunition. They also destroyed one hut and 800 pounds of rice in the vicinity of YA762646. (9) There was light contact reported on 11 December. (a) The 1st Battalion, 14th Infantry located an enemy base camp vicinity YA732643, with 33 bunkers, four foxholes, four shovels, two picks, 11 grenades, three one-quarter pound sticks of TNT , one blasting cap, one canteen, and 700 rounds of 7.62 ammunition. (a) (17 December) The Recon Platoon, 1st Battalion, 14th Infantry located and destroyed 14 huts at YA932556, two huts, 600 pounds of wheat, 300 feet of communication wire and miscellaneous equipment at YA933563, and two huts and 30 pounds of rice at YA932564. (a) B Company, 1st Battalion, 14th Infantry heli-lifted to the 3d Brigade Task Force, 25th Infantry Division Base Camp to participate in the Battalion training and refit program. (10) Operations continued on 26 December with only light contacts. (a) The 1st Battalion, 14th Infantry was heli-lifted into a new area and initiated search and destroy operations in the vicinity of their fire support base established at AR835635, and also in the vicinities of AR819732 and AR814724. They apprehended 17 VMCS who were identified by local villagers at AR805738. (11) On 27 December increased day and night air reconnaissance was implemented. (a) The 1st Battalion, 14th Infantry continued search and destroy operations in conjunction with two ARVN Ranger Battalions and Task Force LUAT in an area of operations north of Pleiku. A Company and a RF/PF unit provided security for the fire support base. C Company searched south to the vicinity of AR811725 and B Company searched the east side of the Ia Krom River (2000 meters east). (14) On 30 and 31 December there was no significant contacts reported in the area of operations. Intelligence information and lack of significant contact indicated that the majority of the NVA units formerly in the area had either been rendered ineffective or had exfiltrated west into Cambodia. This lack of enemy activity and the New Year truce period provided the logical termination point for OPERATION PAUL REVERE IV; thus at 312400 December 1966, the operation came to a close. Our special thanks to George Heidt, of the 1-22nd Infantry, for supplying the After Action Reports.